Moby's Entertainment recording artiste Kashu's latest video for single, "Da Case Deh" debuts on the two major television stations in Jamaica. The video is currently in rotation on Television Jamaica (TVJ), Saturdays Video Alley show produced by Suzie Q and CVM Hitlist. Kashu along with stable mate Jemineye will appear in a live interview this Sunday at 9:30pm on CVM television's Karen D Show so checked that out. 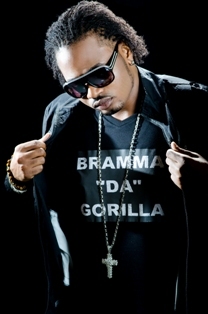 Big Ship/S-Lock Entertainment recording artiste, Bramma 'Da Gorilla' speaks with DJ Crazi Roc on Touch 106.1FM New York (www.touchfm.org) this Saturday, December 1, 2012 about his upcoming Europe tour 2013, debut album to come early 2013 among other news that have been making the rounds on social media over the past few weeks. 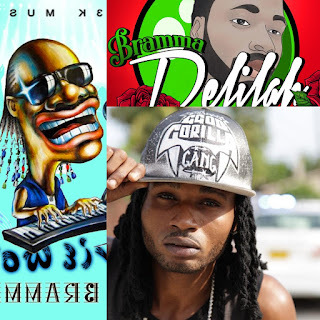 Out now, videos and tracks, 'Bad' on the Face Off riddim produced by Steven McGregor, 'Love Sensimillia' produced by Gappy Ranks and the hot new track, It's Fire produced by Ward 21. 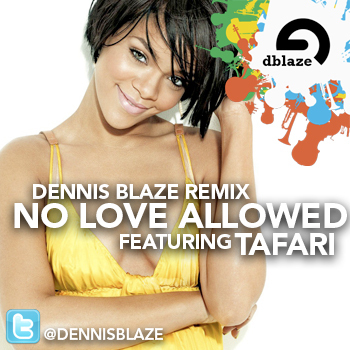 DJ Dennis Blaze dropped his latest remix of Rihanna's, "No Love Allowed" off the UK, US and Canada's No. 1 album of the week, 'Unapologetic' featuring Rud3 Bwoy Tafari. You should check that out as well as Tafari's remix of his 'Money In My Pocket' single featuring Beenie Man and Big Youth. 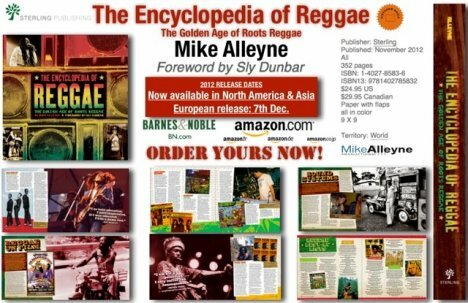 The Encyclopedia of Reggae: The Golden Age of Roots Reggae has just been published by Sterling Publishing (www.sterlingpub.com). Produced by Slideshow Media (www.slideshowbooks.com), The Encyclopedia of Reggae is a highly browsable, authoritative resource on the music's golden age, from the late 1960s up to the mid-1980s heyday of dancehall. Packed with more than 500 images, including rare album art and ephemera, this comprehensive guide profiles more than 200 key performers, record labels, and producers from reggae's history, and offers sidebars on topics such as reggae in film, the development of sound systems, the city of Kingston, and rastafarianism. A vital appendix includes essential reggae best-of lists, a glossary, and a first-ever reggae timeline, a one-stop reference for key dates in the development of the genre. The book is written by Mike Alleyne, a professor in the Department of Recording Industry at Middle Tennessee State University who has specialized in chronicling the cultural and economic history of Caribbean popular music. Alleyne is a frequent lecturer around the globe on the modern impact of Caribbean music and has also contributed to the forthcoming Grove Dictionary of American Music. The legendary reggae drummer Sly Dunbar contributes the foreword, offering a window into the recording studios of 1970s Kingston. Credit line for the book must read: The Encyclopedia of Reggae by Mike Alleyne, Sterling Publishing, 2012. Press images are available, but no images may be used, in print or electronically, without written permission from the publisher. 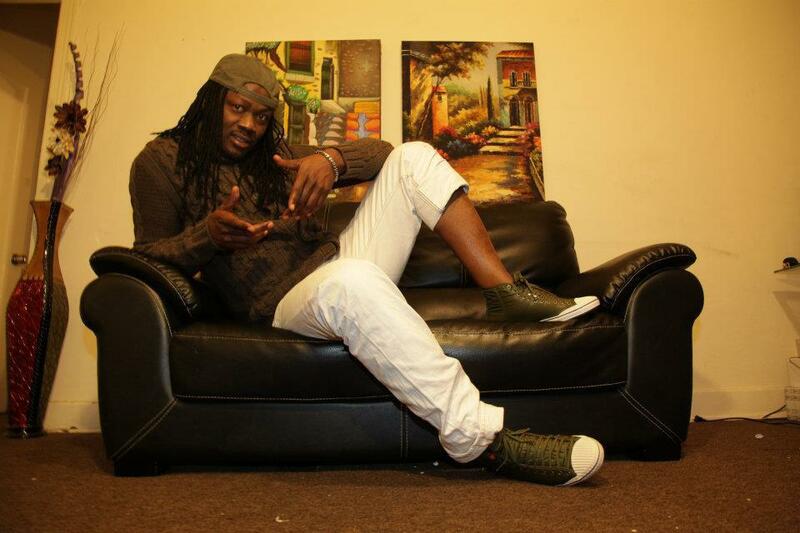 Doza Medicine the 'Whine Up U Body n Gwaan' former Portmore Empire/Gaza artiste has been actively responding to the demand of a likely personal fan base in the making in Trinidad. Recently, Doza visited the twin islands of Trinidad and Tobago to make scheduled multiple appearances which resulted in a satisfactory feedback from the fans and a successful trip for the artiste. 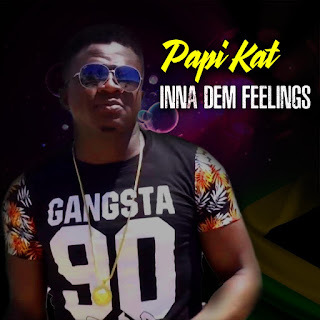 Trini Reggae/Dancehall fans have been ardent supporters of the 'Portmore Empire/Gaza' crew which became prominent after a lyrical confrontation between Dancehall's controversial DJs Vybz Kartel 'D Teacha' and the 'Gully Gad' Mavado. In it's hay-day, the Vybz Kartel lead Gaza crew was a hot commodity and in high demand across Jamaica and the rest of the Caribbean until things took a plunge among crew members and their boss, Vybz Kartel. Internal issues leaked to the media and damning reports surfaced. Popular Gaza students left the crew as Kartel grapple to maintain a good outlook of his empire. But the fans had already seen the potential of many of his young students and were already talking about them so it would have only been a matter of time before the fans started to gravitate to these Gaza bred artistes. It happened sooner than later, Vybz Kartel was imprisoned then one by one, the talents emerged with a multiplicity of creative and innovativeness. Positive or negative the messages they sent said little, their style and uniqueness said it all. 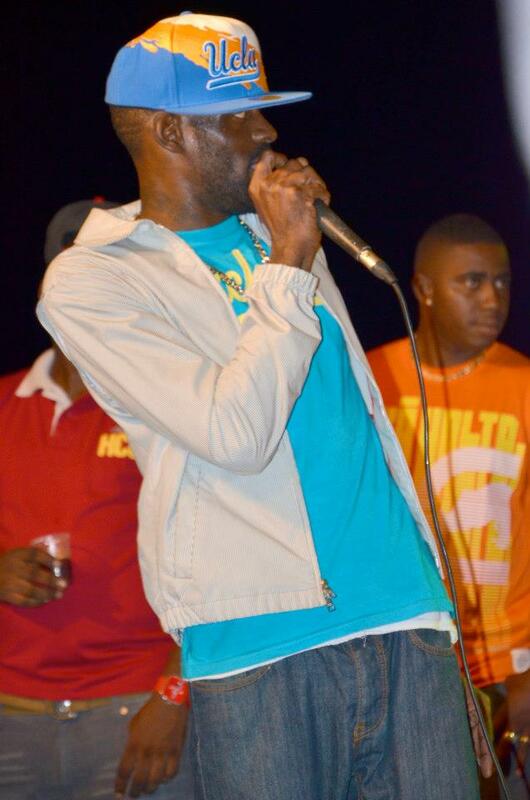 Doza Medicine hang around his Portmore community and watched close friends and former crew members do their thing. Everyone knows him; some believes he's shy while others thinks he is scared, but Doza does not agree with those views, in his mind he is the best and only time will tell. As Doza rocked his Trini audience, see their reaction and feel their energy it all came back. 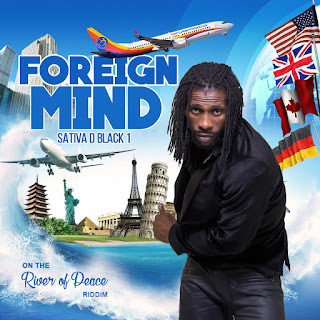 He performed in St. James, San Fernando along with Sheba, Beetham for the President and Tobago sharing stage with Popcaan who headlined a poolside party called "Ice." Females "Whine up Dem Body n Gwaan"
When Doza touched the stage in Beetham, "the fence drop down when me leave" he said. 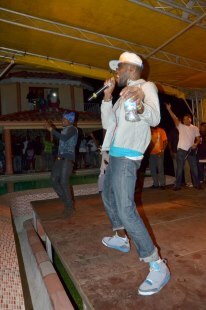 While his performance in Tobago was, 'the sickest, the people dem literally cry eye wata fi me, them nuh waan me leave." Doza's confidence took a boost, he returned to Jamaica satisfied and ready to move forward in making his presence felt, in Dancehall. Bajan beauty and U.S. Pop Star Rihanna, included among 15 tracks off her current US No. 1 chart topping album, 'Unapologetic' released November 19 2012, an authentic Reggae rhythm track called, 'No Love Allowed.' Well we know Rih Rih has reggae influence, after all, she is a Barbadian of the Caribbean, but the pop star has, repeatedly done things that illustrates her love for the genre. In 2011, Rihanna shot her "Man Down" video in Jamaica which to date has received over 186 million YouTube views. Recently, she referred to veteran Reggae-Soul artist, the ever popular, Mr. Beres Hammond's hit song titled, 'They Gonna Talk' quoting the lines, "when they see me with you, wonder what the crowed will say...." to her "Don't Judge Me" Hip-Hop/Pop star beau, Chris Brown in a tweet that made the rounds across the United States media. Rih Rih has been seen clad in her Bob Marley branded swimwear on vacation as well as outfitted in a dress that has Bob Marley face branded across the front when she performed her single 'Stay' on Saturday Night Live (SNL) and included several Jamaican dance moves/slangs in her live performances, videos and songs. Now the pop princess has taken it further paying patronage to the genre by including among her album's various potential hit singles this authentic reggae piece. "No Love Allowed" would make up an album that critics have said, "Is a love letter to Rihanna's beau Chris Brown" who is the subject of an ongoing media battering for a rather serious dispute that involved Rihanna in 2009. While Rihanna continues to keep fans and the global music industry on edge, a striking revelation as it relates to her inclusion of an 'old school' reggae beat on her album, is that this type of rhythm, that has made Jamaican Reggae music a global product, is put on the back burner by many young and new Jamaican artistes though loved and continues to be a favourite in the genre across the world. "No Love Allowed" by Rihanna has already (being included on 'Apologetic'), hit the top of the US Chart this week. One can now watch closely to see how this Pop star's rendition of the Jamaican Reggae beat will impact globally. 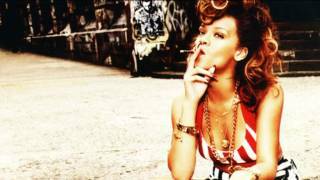 Can Rihanna Reggae track become the next big Reggae hit song across the world? Has Macka Diamond's Lyrical Onslaught Sent Lady Saw Packing? Over the past week the media has been abuzz about Macka Diamond's and Lady Saw's public lyrical confrontation. According to Macka Diamond the disagreement resulted after she released a song titled, "40 n Fabulous." She said Lady Saw later released what sounded like a counteraction to the song with her version titled, "Age is Just a Number" then claimed she had actually recorded her version first. The "40 n Fabulous" Macka Diamond then decided that she was not having it, in other words, "me ready fi anything" she said in her new song. Macka Diamond told N.I.P. that she has tried on several occasion to 'bury the hatchet' with Lady Saw who refuse to extend the courtesies. Macka said her last effort was when she made reference of Lady Saw among other artistes including herself (Macka Diamond) on her '40 n Fabulous' track as one of the '40 n Fabulous" artistes from the 90s era whom Macka claim in the song, "still a run de place doe?" Well after Lady Saw released her 'Age is Just a Number' track which states "ain't nothing wrong with 42" and clearly reiterates her disapproval of the 'age issue,' Macka Diamond released a follow track called, "Me Bless." Clearly a 'diss' song, 'Me Bless' unveiled some real personal issues seeminglydirected at Lady Saw. 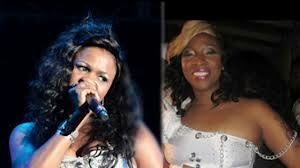 Also on the track Macka mentioned young Dancehall trendsetter Tifa to whom it is alleged had beef with Lady Saw. Macka also told N.I.P. that Lady Saw told an undisclosed person that she wanted her Macka Diamond, "to stop dissing her." But while Lady Saw has been saying for sometime now that she is contemplating going gospel Daddy English's release states that Lady Saw is "fed up with the hypocritical ways of other female artists."